I would like to mention the LC Sheraton Grande Sukhumvit in Bangkok which has no lounge but utilize common areas to accommodate their guests in Luxury rooms and Suites (and Plats), for instance lovely live Jazz performances during happy hours. This is a property I hope never will add a lounge since the current arrangement is so much better. It's not a lounge, just a regular bar that turns into bar area where they serve food and drinks for plats for 2h every evening. Well I am glad you are mentioning this. I was considering to stay there and I made the incorrect assumption that there was a Club Lounge because SPG.com says "executive club benefits" on some room types and I read somewhere about drinks and hors d'oeuvres for Platinum members. I thought it was in a lounge and that I would be able to go there for breakfast as well, or in the afternoon / other times of day. Our apologies for any inconvenience, but we were unable to find this language at spg.com for any room type, suite or otherwise, at the St. Regis Chengdu. If you could direct us to where you found it, we would be glad to follow up on it further. It is on the left of the screen, under the picture of some room types. See second bullet point below. Sorry, but Sheraton Warsaw and Westin Dragonara Malta - I can't put on this list they have standard club lounges. Marriott Gold don't get lounge access at SPG properties. At least not yet. It's the other way around. 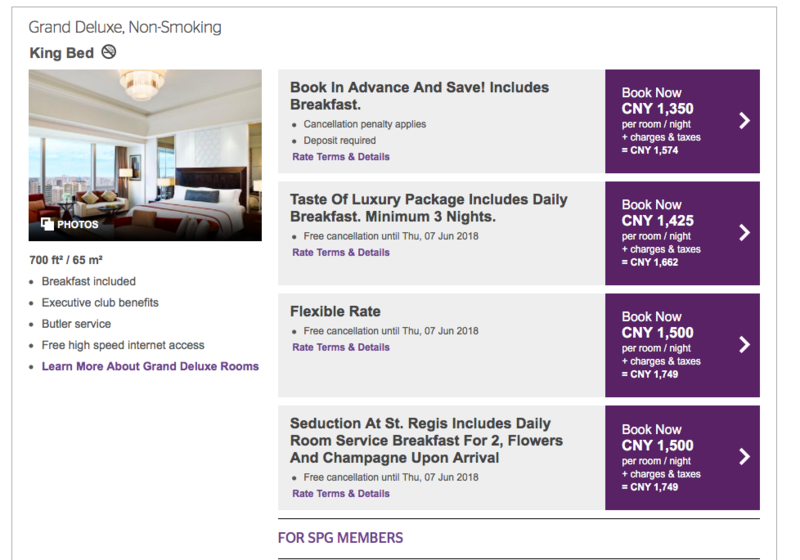 SPG Gold gets access to Marriott lounges now! Need to be Gold or higher to access lounges at Marriott properties. Need to be Platinum to access lounges at SPG properties. Unless it's property specific. I remember that at the Westin Turtle Bay, Gold members (SPG and Marriott) were given lounge access. When I was still SPG Gold member last year 2017, LM Putrajaya allowed me to access their Exec lounge on every stay I had with them and sometimes they do upgrade me to their suite which I am not complaining as I was still Gold level at that time. I didn't ask them why maybe LM PJ wants me to stay with them instead with another Marriott Putrajaya up the street. The breakfast is in main restaurant only, but it's very decent by Chinese standards and doesn't feel too crowded or overwhelming. There is a proper lounge at the Sheraton Chengdu, the renovated rooms are very nice and I got upgraded to a huge suite (plus got all 3 plat amenities - points, breakfast and the local amenity which is a totally adorable plush panda toy), on the bad side almost nobody speaks English at the hotel. Overall the StR is just slightly more expensive but much better property in all aspects. Agreed on LM KL, probably the best in the system, and especially good given the price point. I would currently add the lounge replacement benefit at Sheraton Macau; it’s generally a pretty lame hotel, but while the lounge is closed, Plats get full restaurant breakfast plus dinner at the seafood buffet or hotpot place (which also has a bar with top shelf liquor). Yes. Yes. Yes. Agree on both points. In fact I go to Macau just to take advantage of this if I’m bored for the weekend. Got to be the best value in the system for Platinums at the moment. Sad news for you (and many more) — Sheraton Club Macao is reopening on Sunday (March 25)! Sheraton Saigon has tasty food, and they do rotate it a bit. Weak drinks. Sheraton on the Park Sydney has the best view, but food is really hit and miss. I have stayed there 4 times and used the lounge about 6 or 7 times during the pre-dinner hours. Only one time I got fresh prawns and oysters. Decent variety and they do rotate a lot. Grosvenor Dubai has the most, but the taste is lacking for me. I didn´t like the food there at all. If you want truly great lounge, GH Tokyo back then would blow these 3 out of the water. Same with Fairmont club in Singapore. Real champagne, hot food, great taste. Hopefully, renovation makes it an even better lounge. I haven't stayed there in nearly a decade so I have no idea if it's stayed at the same level, but the most elaborate club spread I've ever seen at an SPG hotel was at the Westin Beijing Chaoyang ... huge spread of food, more comparable to a restaurant buffet than your typical club lounge. Easily managed to make a substantial dinner out of the offerings a couple of times. That and Grosvenor House are the only two I can think of that I've really been dazzled by. And I like the Prince Gallery Tokyo but I agree with others it's not really in the same league. So with the SPG Business credit card, I book the cheapest available room direct with my card and get lounge access and breakfast at all Sheratons (except resorts), where lounges exist. No fee for first year and card is then $95 annually. One visit a year pretty much pays for annual fee. Gold Elite for both Marriott and Sheraton with annual $30K spend. How Is SPG Amex Business Card Access to Sheraton Lounges Fulfilled at the Hotels?